TrueERP, operating since 1994, is a global organization formed of a network of partners. Combined, TrueERP solutions providers serve over 6000 companies with business process management, enterprise resource planning, supply chain management, business intelligence, and all other facets of managing a modern organization in an increasingly global economy. 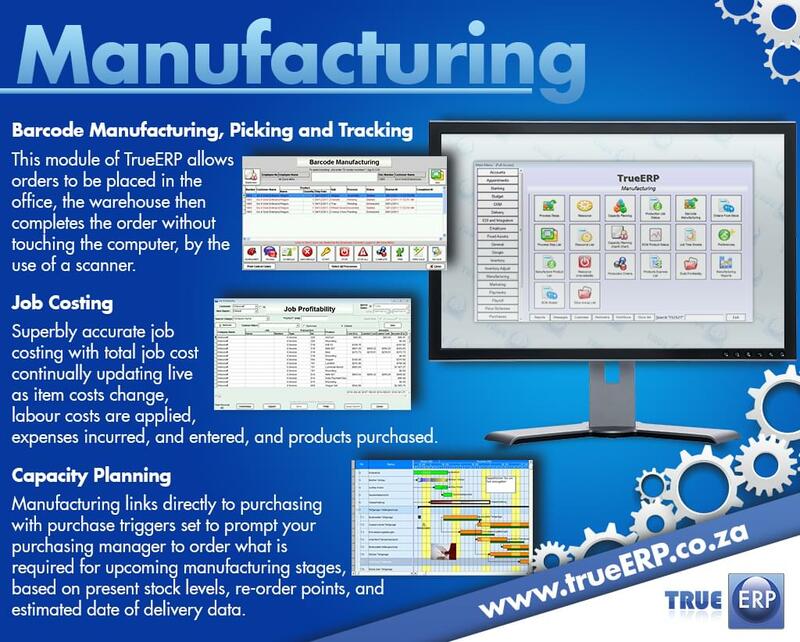 The TrueERP platform offers truly comprehensive functionality. Modules exist for every major business area, including accounting/finance, job costing, service management, customer relationship management, marketing, sales operations, sales force automation, executive reporting, ecommerce operations, supply chain management, inventory and warehouse management, payroll, recruiting, and core human resources management. The source code for the ERP Suite is a semi-open source effort. Several ERP companies around the world collaborate on the system and all additions and updates are made available to all users. Should any one franchisee or Reseller fail, for any reason, a new or existing franchisee can simply be appointed as a replacement without any disruption in service continuity. In addition, every 12 months each franchisee or reseller must re-apply for their license to sell and market the software from the parent organization, helping ensure high standards are maintained at all levels. TrueERP prides themselves on having unparalleled customer service and a highly trained product support team. We recommend the TrueERP system to any sized business in almost any industry, but especially small-to-medium manufacturers, distributors, retailers, and companies wanting a pre-integrated ERP and ecommerce solution. Not sure if TrueERP is the right solution for your organization? Want help comparing TrueERP to similar platforms? Call, click, or email to speak with one of our unbiased Technology Advisors for a no-cost, no-obligation evaluation of your company’s unique requirements. Learn everything you need to know about TrueERP. Our experts will reach out to you shortly.